On My devices page, users can view the existing devices (iOS and Android) linked to their account. 1. The text is informing you what is the number of devices that you can have on your account. 2. Here you can see the number of the devices linked to your account. 3. Here you can see the number of the devices that can be linked to your account. 4. Here you can see the type of the device linked to the account. 5. Here you can see the date when the device was linked to the account. 6. 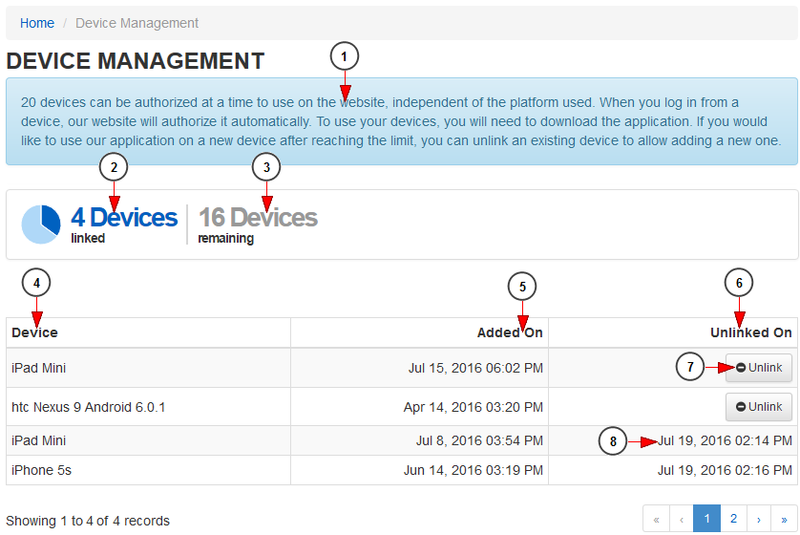 On this column you can view if the devices are unlinked from your account or to unlink them. 7. Click here to unlink the device. 8. Here you can view the date when the device was unlinked from the account. Note: the devices are automatically added on user’s account once he logged into the RevMediaTV application using the mobile application.